Explorations and Surveys for a Rail Road Route from the Mississippi River to the Pacific Ocean. War Department. Route near the 41st Parallel. Map No. 1 From the Valley of the Green River to the Great Salt Lake; from Explorations and Surveys made under the direction of the Hon. Jefferson Davis, Secretary of War. This is a rare and important 1855 map of parts of Utah and Wyoming prepared for the Pacific Railroad Survey. Covers from the Great Salt Lake eastward to the Green River Valley and Brown's Hole. Extends southward as far as Fillmore and northward as far as the Bear River. Shows much of Great Salt Lake, Salt Lake City, the Spanish Trail, and the Emigrant Route to California. Also offers extraordinary topographical detail of the region – mostly attributable to the work of Egloffstien, the expedition's topographer. This is the first of a series of four maps drawn and surveyed By Captain E. G. Beckwith with the intention of determining the best route for a railroad from the Mississippi to the Pacific. 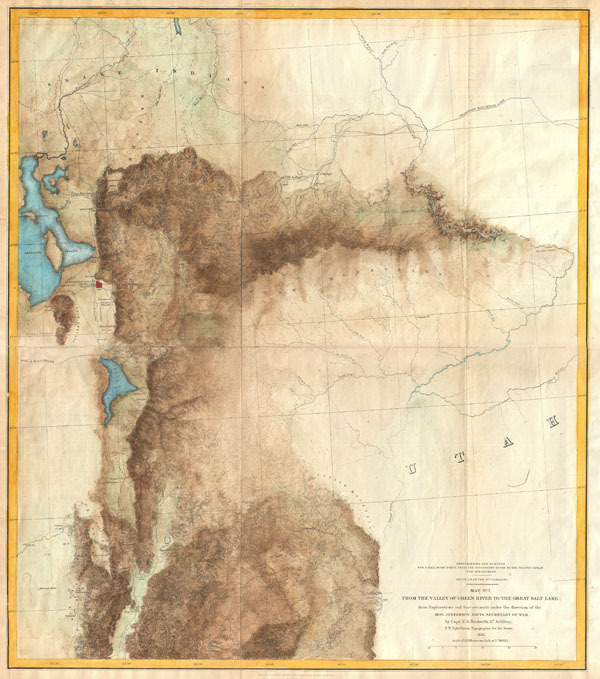 Picking up where his predecessor Gunnison, who died while doing his own survey's of this region, left off, Beckwith surveyed passages along the both Weber and Timpanagos canyons. He ultimately proposed three possible railroad routes. The northernmost route crosses the Green River near Black's Fork and continues past Fort Bridger (now Wyoming) and along the Weber River to Ogden City where it turns south. The middle route leaves the Wasatch Mountains via Timpanogas Canyon. The southernmost route runs westward from the Oquirrh Mountains. The northernmost route, which was advocated by Beckwith in his report, was chosen and it is roughly along this path that the transcontinental railroad was eventually built. Prepared under the direction of Secretary of War Jefferson Davis by Captian E. G. Beckwtih and F. W. Egloffstein. Engraved by Selmar Siebert in Washington D.C. The Pacific Railroad Surveys (1853 - 1855) were established in 1853 with the goal of identifying the best possible routes for a transcontinental railroad from the Mississippi to the Pacific. The need for transcontinental railroad made itself evident shortly after the California Gold rush when the westward expansion was at its heights. The federal government, acting under the Sectary of War, Jefferson Davis (of Civil War fame), initiated a series of expeditions of the western territories. These expeditions included surveyors, cartographers, artists, zoologists, botanists and geographers. The resultant work, a 12 volume compendium entitled Reports of Explorations and Surveys, to ascertain the most practicable and economical route for a railroad from the Mississippi River to the Pacific Ocean eventually led to the constructions of several different transcontinental railroads. Reports of Explorations and Surveys, to Ascertain the Most Practicable and Economical Route for a Railroad From the Mississippi River to the Pacific Ocean. Made Under the Direction of the Secretary of War, In 1853-56, According to Acts of Congress of March 3, 1853, May 31, 1854, and August 5, 1854. Volume XI. Washington: George W. Bowman, Printer. 1861. 36th Congress, 2d Session, Senate, Ex. Doc. Very good condition. Wear and verso reinforcement along original fold lines. Rumsey, 0693.082. Wheat, C., The Mapping of the Transmississippi West, 1540-1861, #822. Goetzmann, Army Explorations in the West, p. 286–287. University of Nevada, Las Vegas, Map Division, G4051.P3 1855.E553 no.1.